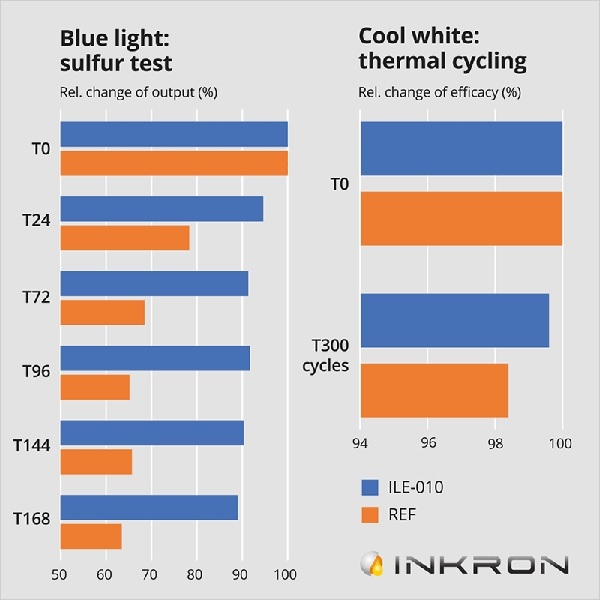 Inkron is very excited to announce the release of ILE-010, a reliability boosting barrier coating product for LEDs. This new LED packaging innovation greatly enhances the reliability, performance and lifetime of LED devices including high-power LEDs and novel micro-LED devices. With the introduction of this novel siloxane high-density layer, LEDs can now withstand exposure to corrosive compounds and survive better e.g. in sulfur containing atmospheres. As additional benefits the ILE-010 layer also provides lower color dispersion and improves thermal cycling performance. Targeted at packaging LEDs, lasers and other optoelectronic components that are used outdoors and in industrial and harsh environments, this product guarantees exceptional operational reliability. ILE-010 is a low cost of ownership material and easy to add to existing assembly lines while significantly enhancing product quality. Visit our #booth #B18, at Bregenz LpS Show between 25-27 Sep 2018 to hear more about Inkron’s barrier solutions.